Tobin Montessori School, a pre-K–5 public elementary school in Cambridge, Massachusetts, sits across the street from 162 acres of open space that surrounds the 155-acre kettle lake called Fresh Pond. The Cambridge Water Department is in charge of Fresh Pond Reservation (FPR), as well as other watershed areas owned by the city (but in other municipalities north of Cambridge). Many Cambridge public and private school classes visit Fresh Pond occasionally for science study. For example, third-graders across the district have long visited FPR for a curriculum unit called “Habitats.” The public school system’s science department maintains the Maynard Ecology Center for the use of such visiting classrooms. As you think about how to connect your classroom or your school more closely to a single habitat, open your mind to multiple channels of connection. Want a STEAM connection? Or, will an afterschool program fit the bill best? Which grades can most easily get outdoors? As an example, I offer this description of the multiple ways one preK-5 elementary school involves kids in the local wild space next door. Four programs—Tobin Friends of Fresh Pond, Children’s House Field Studies, Art & Science in One at Tobin, and our Honk! Parade: Contingent of Fresh Pond Plant and Animal Ambassadors—connect Tobin Montessori School and its community to Fresh Pond Reservation, in addition to the Habitats curriculum that involves all of the city’s third graders. 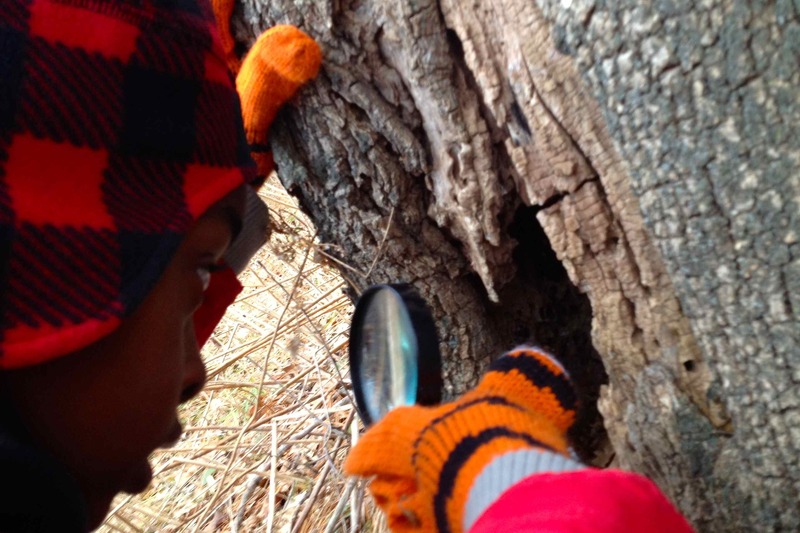 A kindergartener examines a tree cavity at Fresh Pond Reservation. Children’s House is the name, modeled on Maria Montessori’s original Casa de Bambini, for Tobin Montessori School’s mixed-age classrooms of 3-, 4-, and 5- year olds (some of whom turn six in their last, or Kindergarten, year of Children’s House). There are five Children’s House classrooms at Tobin. In November 2011, one classroom began a pilot program of monthly excursions, usually lasting two hours, at Fresh Pond Reservation. The emphasis of these visits is on children’s natural curiosity and their developing skills of close observation and inquiry. Two years after the start of this pilot, other classrooms in Children’s House expanded the field study program by going on their own outings to the reservation. In Fall 2013, each of the five classrooms of Children’s House at Tobin Montessori School plan regular field studies at the reservation (some monthly, some weekly, some in-between). Depending on the current curriculum, teacher interest, and other variables,these “field studies” may center on seasonal changes (phenology), plant identification, animal classification, nature observation, soil and water study, fundamental needs, plant and animal life cycles. The Tobin Friends of Fresh Pond after-school club began in September 2011 with a vision of holding a long outdoor session (two hours, weekly) in a relatively wild habitat with small-group camaraderie. The early club was a STEAM (Science, Technology, Engineering, Art and Math) project at heart, with an emphasis on hands-on environmental education, games, and art rolled into one. Piggybacking the Montessori pedagogy—through which this particular group of children learned during the school day—onto an overarching goal of seeding environmental stewardship was a natural and easy symbiosis. But taking that natural affinity between Montessori, the child, and nature into an afternoon, out-of-school-time context, was also a balancing act. The club was constantly evolving—in approach, in curriculum, in demographics. Just playing outdoors in nature became a prominent feature, with fewer attempts at didactic “education” than in early incarnations of the club. See photos of Garlic Mustard Ball at Fresh Pond Day, 2012. The club is currently not in operation. Art & Science in One was launched within a particular fourth-grade art class at Tobin Montessori School in Spring 2013 and now operates as a classroom-embedded, one-to-one mentoring program with volunteers recruited, screened, trained and supervised by Cambridge School Volunteers, a partner of the Cambridge Public Schools. The program serves one classroom of fourth- and fifth-graders (Montessori Upper Elementary) and is funded by the Cambridge Community Foundation and the Friends of Tobin School, Inc. Pairs of students and volunteers learn outdoor observational drawing from a drawing instructor who is also a professional science illustrator and practice these skills together both near the school outdoors and at Fresh Pond Reservation. On September 20th, 2012 the Friends of Tobin and the Friends of Fresh Pond Reservation collaborated for the first time to offer a one-day mini-park in the Huron Village neighborhood of Cambridge on International Park[ing] Day. Our theme was PLAY OUTDOORS, and our parking-spot sized park featured a mini-diorama of Fresh Pond’s Kingsley Park (with movable end-users), nature objects for exploration by the very young, books and field guides, and red-winged-blackbird costume-making. >>>Photos of our 2012 Park[ing] Day Park. On September 20th, 2013, the two organizations collaborated once again, this time assuming an alter ego, the Cambridge Park of Microscopic Life. The star of the show? Microscopes borrowed from the Maynard Ecology Center and the Harvard Museum of Natural History. Pond water from Black’s Nook, provided by Ranger Jean Rogers, stole the show, in all its algal, zooplankton- and otherworldly glory. Children who visited the park during the whole-day affair created handpuppets of algae species that live at Little Fresh Pond and Black’s Nook. >>>Photos of our 2013 Park[ing] Day Park. Parking Day in 2014 found Tobin’s parklet directly in front of the school! Pond in the flagship parade of the Honk! Festival. Photos from the 2012 Honk! Parade are here on Flickr (Search for photos posted by “In the Big Muddy”). Honk! Parade 2013 featuring our Great Blue Herons. Wings and wheels always welcome! Assembling for the Honk! Parade in 2016. Note our new snapping turtle (center), two-person chipmunk (left), and red-winged blackbird (right). By 2015, the school-specific marching group had morphed into and merged with the Cambridge Wildlife Puppetry Project, supported that year by a grant from the Cambridge Arts Council, drawing children and families from all over Cambridge to bring herons, fish, flowers and turtles (and more) to life along the parade route every year. Is Your School Connected to a Habitat? The connections between Tobin Montessori School and the little bit of Cambridge it calls home are not particularly pioneering. Hands-on, outdoor work with the natural environment are found nationally and internationally in school settings. But such connections with neighboring open space are most successful when shaped by the school community as a whole, rather than imposed by curriculum. Success will come from coalitions that are built over time. And particular schools aren’t the only place to connect kids with the outdoors. Children’s connection to nature is something that can’t be fully realized unless teachers and schools, OST teachers and providers, community organizations, STEAM proponents, families, and city departments are working together.